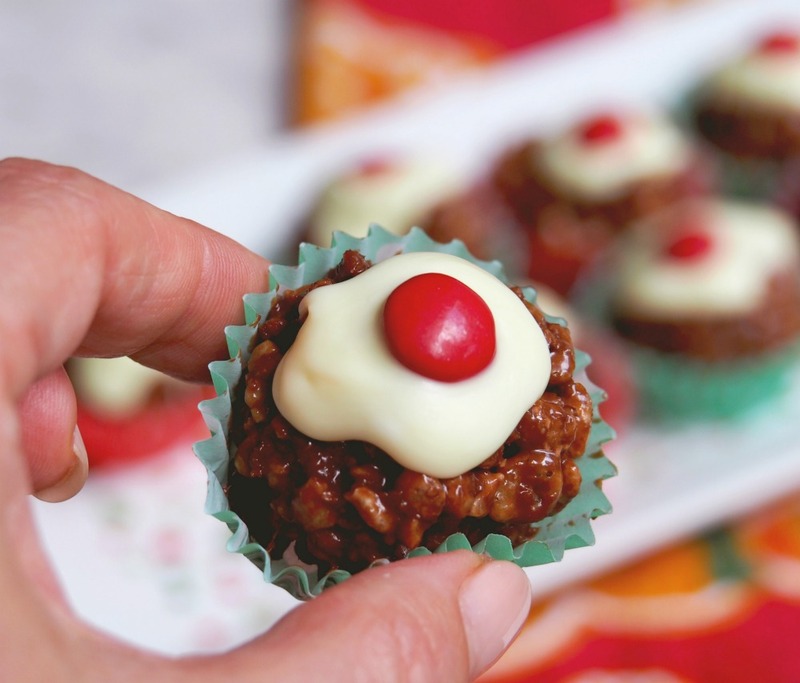 These cute mini Mars Bar Christmas Puddings will go down a treat at Christmas parties and they’re so easy even the kids can make them! This recipe was actually a happy accident. I wanted to make some sort of chocolate crackle pudding for Christmas but when I went to the pantry, we were out of milk chocolate because someone who shall not be named had eaten it while I was overseas! We were fully stocked in the Mars Bar department though and it turns out that with all that chocolatey caramelly goodness, Mars Bars make the perfect chocolate crackle – chewy and crispy in equal measure! I have had a long term love affair with Mars Bars ever since I used to eat them for breakfast before my exams at high school… And for breakfast before every test and exam I’ve taken since. In fact, I proudly attribute all my academic success to my Mars Bar breakfasts, I know it sounds a bit mad but don’t knock it until you try it ‘kay? In recent years, I’ve swapped Mars Bars for breakfast for Mars Bars in baking… Remember those yummy Mars Bar Cookies, those scrumptious Mars Bar Brownies and let’s not forget Heather’s mars-vellous Mars Bar Slice! 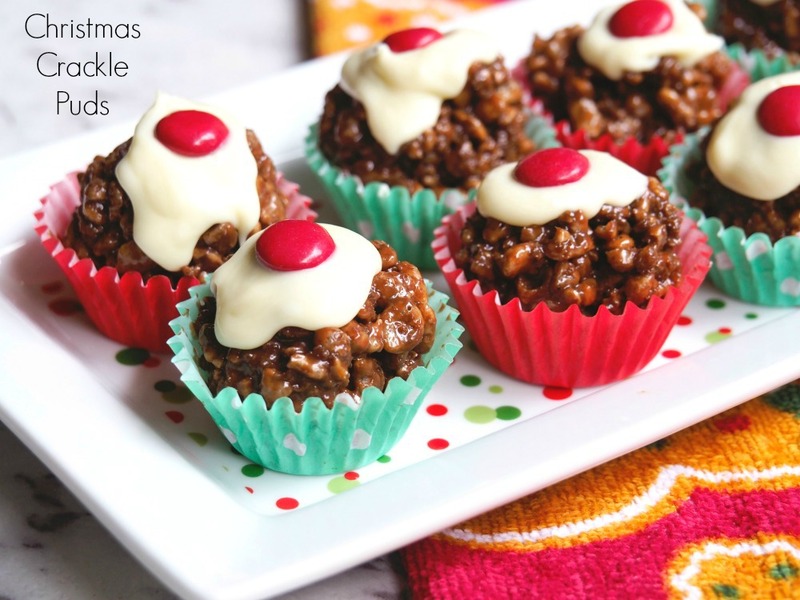 Like my Easy Christmas Cupcakes, these mini crackles are super simple to make. 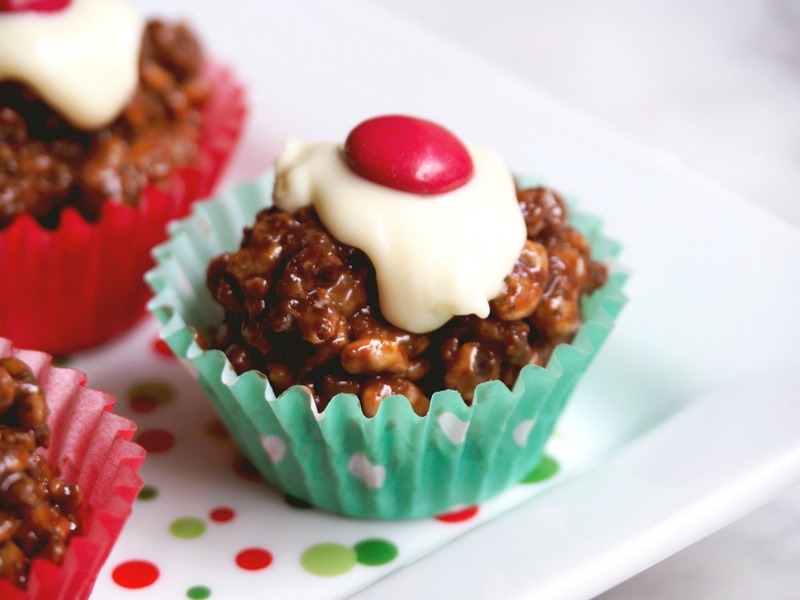 I got a bit OCD over my puddings and used an egg cup and some plastic wrap to get the perfect shape every time, but if you’re pushed for time or not bothered, just dollop the chocolatey rice bubbles into dome shapes and you’ll be right! I also like my melted chocolate to sit for a bit so that it thickens slightly, it makes decorating these little puds so much easier. But if time is tight, just drizzle and go! And the best bit is, because these puds are so small, surely that means you can eat more of them! Well, that’s my theory and I’m sticking to it! What’s your favourite chocolate bar? 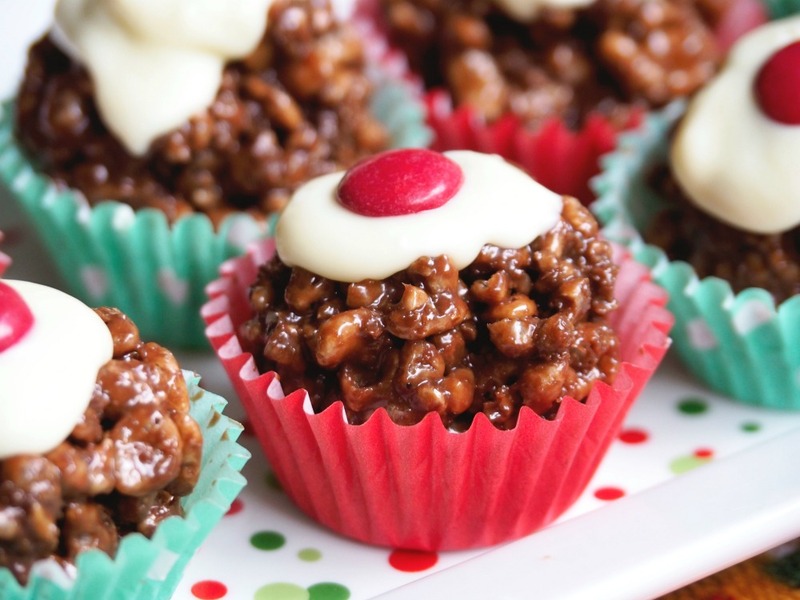 Have you got a favourite festive treat? Place the Mars bars, cream and cocoa in a large, heatproof bowl over a saucepan half filled with simmering water, making sure that the bowl doesn’t touch the water. Stir with a metal spoon until the Mars bars havemelted and mixture is smooth. 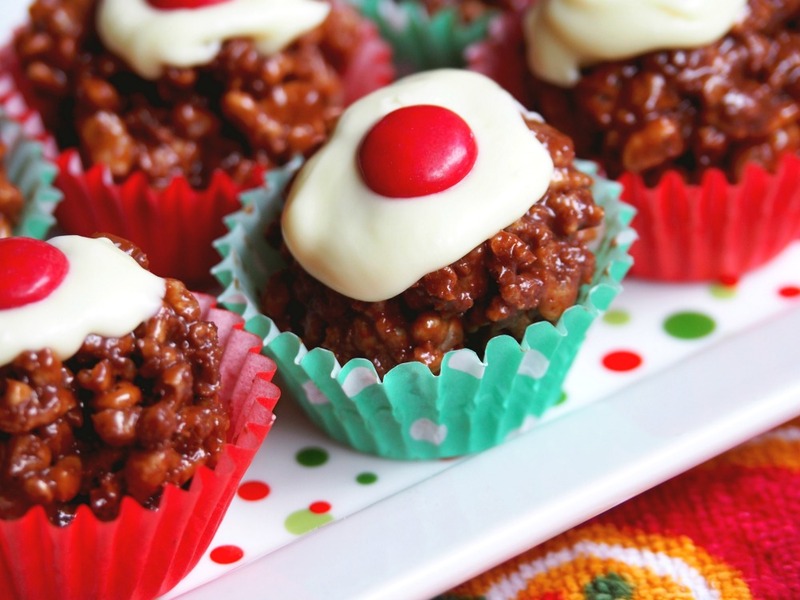 Place the rice bubbles in a separate bowl, add the chocolate mixture and stir gently, coating everything well. Line an egg cup with plastic wrap. Place a heaped tablespoon of the mixture into the lined egg cup, press down firmly and then carefully remove, peel off the plastic and place into a paper case. Alternatively, just spoon the mixture into dome shapes in the paper cases. Let them set in the fridge for a couple of hours or until firm. Break the white chocolate in to chunks and melt in the microwave in 30 second bursts. Depending on how cold the chocolate is and the strength of your microwave, this should take 2-3 minutes. Allow the chocolate to stand for a few minutes for it to thicken slightly. Place the Mars bars into TM bowl and chop for 10 seconds on speed 8. Melt for chocolate for 2 minutes at 60 degrees on speed 3. Add the cream and cocoa and heat for another 2 minutes at 50 degrees on speed 3 or until mixture is smooth. Add the rice bubbles and mix for 1 minute on reverse speed 1 or until coated well. Place the chocolate melts in TM bowl and melt for 2 minutes at 60 degrees on speed 2 until chocolate is melted and smooth. Alternatively, break the white chocolate in to chunks and melt in the microwave in 30 second bursts. Depending on how cold the chocolate is and the strength of your microwave, this should take 2-3 minutes. Allow the chocolate to stand for a few minutes for it to thicken slightly. Spoon the melted white chocolate over the puddings and decoratewith an M&M. Set aside until set. TIP! 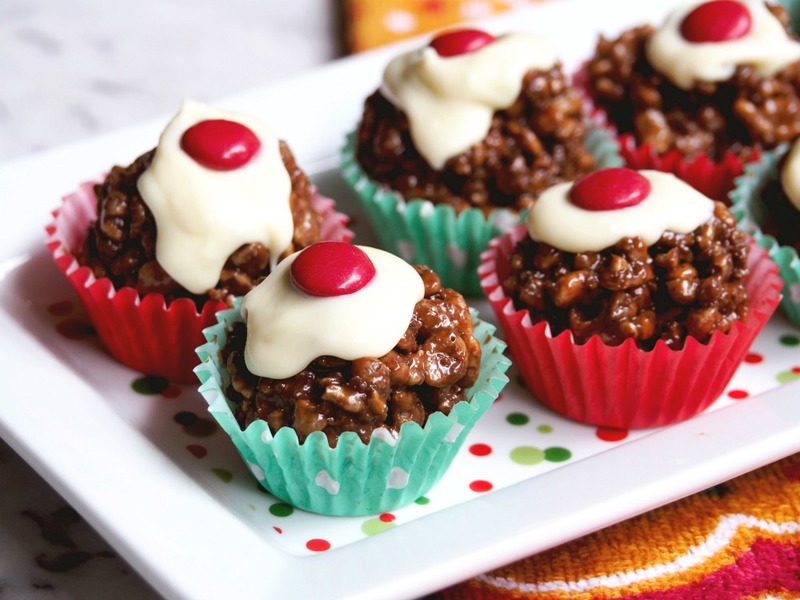 If you’re making these in the Thermomix, “clean” the rice bubble bowl with some milk (and for something more grown up, a sneaky splash of Baileys) for a delicious chocolatey drink.